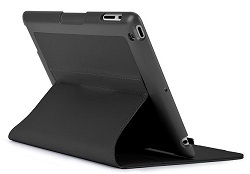 Specially designed to complement your minimalist iPad, the slim, lightweight cover looks good—and feels good, too. Open FitFolio and—voila! - your iPad wakes up. Close it, and your iPad goes to sleep. Reading? Writing? Re-watching that funny YouTube video? With four viewing angles, you'll get the one that's right for you. Makes it easy for simple one-touch switching between four devices. The perfect partner for comfortable typing & standardized testing. Provides 4000mAh of power in a remarkably portable, compact design.